In 1933, Mildred and Robert Woods Bliss commissioned Beatrix Farrand to design a “superintendent’s dwelling” for their Georgetown estate. When the Blisses gave Dumbarton Oaks to Harvard University in 1940 and the property became a research institute, this building was called the Fellows Quarters. Subsequently renamed the Fellows Building, it initially served as the residence for unmarried male Fellows and scholars and later for all fellows. In the twenty-first century, this building was rechristened the Guest House. During its long history, the Fellows Building has enriched the experiences of generations of scholars working at Dumbarton Oaks. It has fostered closer connections among the fellows and facilitated informal discourse during the meals and leisure hours that fellows shared in the dining and living rooms. There were about half a dozen of us living in the building at the time, and we were treated very nicely. We were given full board. And we had the advantage, of course, of meeting quite a lot of interesting scholars who came and went. The resident staff came in for lunch every day, so we really got to know them pretty well. Here was the real center of Dumbarton Oaks—this room, for me—in terms of dialogue/discussion, because everybody was sitting here around, and also a lot of guests. So, the guests were officially welcomed after lunch here, and they talked with the faculty, and so it was not just the faculty, but a lot of guests, also from Europe—Fellows, guests for a short time, then guests from Princeton or Harvard. So, the biggest impression I got from Dumbarton Oaks was in this room. One holiday morning, I was sleeping late—because it was a holiday—and I woke up to Weitzmann shaking my foot because I hadn't shown up for breakfast and he wondered what was the matter. So, he came into my room and he said, “Wake up! Wake up! You mustn't lose any time for scholarship!” So, it's not every day that you have someone of that—how shall I say?—standing shaking you by the foot to wake up and get busy with your scholarship. My favorite story about the air-conditioning was Kurt and Josepha Weitzmann living upstairs here. And one day I came back here, and Josephita was standing in this room screaming. She was a small, very large-lunged, powerful little Russian woman and was incomprehensible especially when she was screaming. And she said, what I finally understood, “they are killing my coat” and they were killing the coat by virtue of the air-conditioning. And she demanded that throughout the Fellows Building this newfangled thing be switched off. And of course, because the hierarchy to some extent still maintained, when Weitzmann wanted the air-conditioning off, off the air-conditioning went. Well, it had good sides and bad sides. “Bad” is perhaps too strong a word, but we didn’t have individual baths, for instance. We had to use all facilities together with the other Fellows, which at times became kind of a nuisance. You’d have to wait to take a shower, and also the walls were paper thin. And occasionally I heard my roommate in the next room saying his prayers—in Greek. But on the whole, it was a very fruitful experience. Three meals a day with the same people, after a while, limits conversation. I think there comes a point when you’ve said almost everything you can say. So, even if you may be friends with everyone, sometimes it became kind of a—let’s say—static experience. Life in the Fellows Building also offered the great advantage of having close proximity to the library, a perk well appreciated by scholars in residence. Sidney Griffith remembered: “I was very happy to be able to live in the Fellows Building because it meant I was right near the library.” Marie Spiro reflected on her time as a junior fellow in Byzantine Studies, calling “the propinquity of the library” a major draw, especially since the library was open until midnight at the time, allowing her and her husband to work there late into the night. The nearness of the library was especially important for scholars who pursued research at Dumbarton Oaks in the early years, as books could be checked out of the library and brought home to the Fellows Building—a policy that has since been discontinued. Social interaction at the Fellows Building was far from limited to just intellectual discourse. The residence also was the preferred venue for hosting parties. Thomson remembered how the junior fellows approached the Byzantinist Ernst Kitzinger with the request that the old radio in the Fellows Building be upgraded, resulting in the installation of a “good stereo system.” Thomson purchased additional wires so that that the stereo could be moved into the dining room, where the fellows would dance in the evenings, accompanied by other young people in the area whom they met mostly through embassy contacts. Elizabeth and Michael Jeffreys, former fellows and visiting fellows in the Byzantine Studies program, recalled that people who could afford the expense hosted the gatherings. Michael remarked that the parties that he and his wife hosted were “very mild,” noting that they “simply produced a few canapés and some alcohol.” However, Jelisaveta “Seka” Allen, a Byzantine library cataloger at Dumbarton Oaks, supposedly had a recipe for a delicious but potent “strawberry punch” responsible for the inebriation of more than one unsuspecting party guest. The “Ravenna Group”: Ernst Kitzinger as Justinian, Arthur H.S. “Peter” Megaw (Byzantine Visiting Scholar) wearing Justinian’s crown, his wife Electra Megaw as Theodora, and Susan Kitzinger and Jelisaveta “Seka” Allen as attendants in Theodora’s retinue. Dumbarton Oaks Archives, AR.PH.Misc.228. Henry Maguire, former junior and senior fellow and later director of Byzantine Studies, and his wife Eunice remembered parties in the Fellows Building, especially a “Guy Fawkes” party at which marshmallows and hot dogs were roasted in the fireplace. 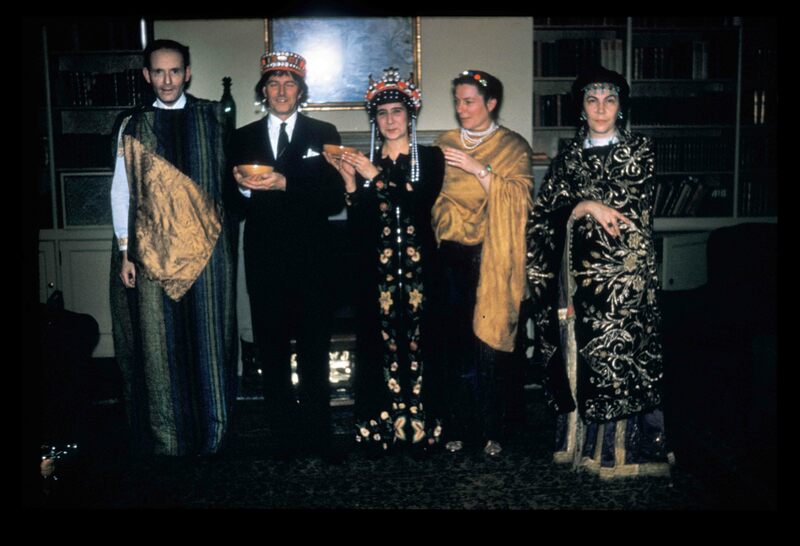 Eunice also remembered Halloween parties that people attended in costume (including, naturally, Byzantine garb). After initially hesitating to get involved in such fun, Betsy Rosasco, a junior fellow in Garden and Landscape Studies, admitted that she concluded that it would be “counterproductive” to “not go to the parties” in order to find out about the “fascinating bunch” at Dumbarton Oaks. My wife and I—who I’ve been married to for 43 years—lived in one room upstairs in the old Fellows Building, and it was sort of like being in camp all over again. We have a very nice home in Montreal with a big backyard. We garden and do all sorts of things. And I must say living in one room upstairs was quite a challenge, and the fact that we're still married indicates that we might still get along fairly well! Providing a home for both intellectual and social exchange, the Fellows Building came to be a beloved component of the Fellows’ tenure at Dumbarton Oaks. 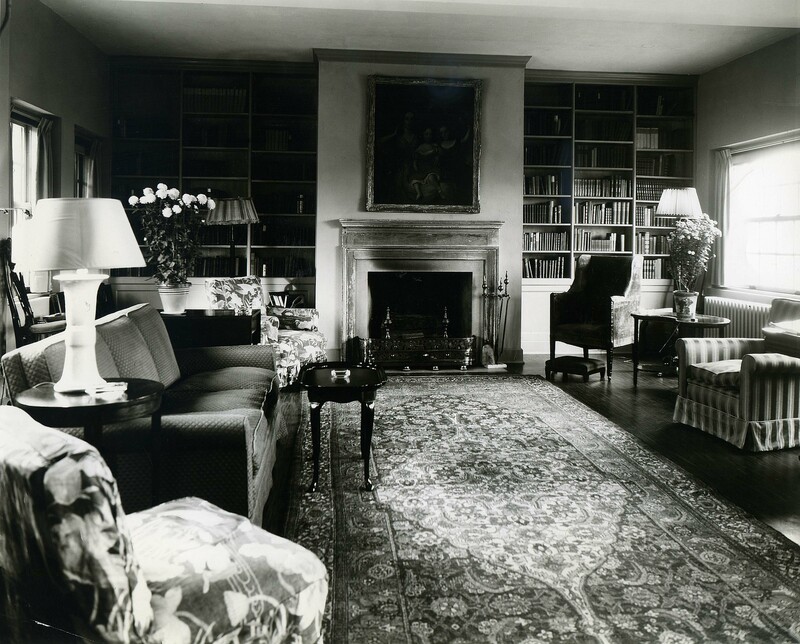 Looking back on her time at Dumbarton Oaks, Marie Spiro remarked: “It was a wonderful experience, not only because we were cared for, but because all the visiting scholars were given rooms in the Fellows Building.” Those days, however, are gone. Today, fellows are housed in the state-of-the-art Fellowship House, complete with amenities—such as elevators, a gymnasium, and a music room—never known in the old days of the Fellows Building.